The Project Pad • View topic - Basic 07K Facts? Wow. So the mule loses out by .3l and a bit of compression. But has a spool valve, and for all intents and purposes, those are pretty similar sized turbos. It'd be nice to see the mule building boost "normally" without surge. Still, the 07k is making so much more torque early on its insane. Very cool to see how the different setups work. Only thing better would be same exact turbo. I'd love to see that from 2-8500. For me the story is how much time the 07k can spend over 200 WTQ. How effective is comparing TT-RS numbers to a 20vt versus the Base 07k to a 20vt? .... how much is direct injection helping here? AND, Does the stock TT-RS head ports flow better than base 07k?... I know the comparison above has "Shrick 11mm" ... but without cams, has the stock TT-RS head been compare to an 07k head on a flowbench? On e85, direct injection does nothing. On gas, overall hp it does little, though it does help modrange torque. Oems with dual rail setups are using GDi at torque peak and then blending in port injection up top. The TTRS cams have the same exhaust valves, 1.5mm bigger intakes. Yes, they do flow more. The shrick cam is slightly larger than the stock ttrs cam, but the majority of the reason we use them is for the higher lift on the direct injection cam lobe for more fuel delivery. The fastest 2.5 in the world is on bone stock head these days. Base 07k cam comparing is like comparing them to 3b cams. Both are dead by 6500 rpm. TTRS intake is a good powerband to 7500, shricks to 8000 and IE cam to 9000. Hank wrote: Yes, The translation is insane power at low boost levels. The following is TTRS on e85, .85AR 6467 in the way of Xona 8267, Shrick 11mm cams, valve springs, stock head, 9.5:1 compression. The Mule is the other line, 6766 turbo via EFR 9174 on a spool valve .92 AR. E85, CNC head, Cat 305s set at 119/111, 9.3:1 stock compression, etc. Same day pulls. So yeah, the 20vt can eventually come close to peak, but on a bigger turbo, it still requires more boost vs the TTRS. Note the mule step on ramp up for boost. That is to keep it out of surge. That's insane. 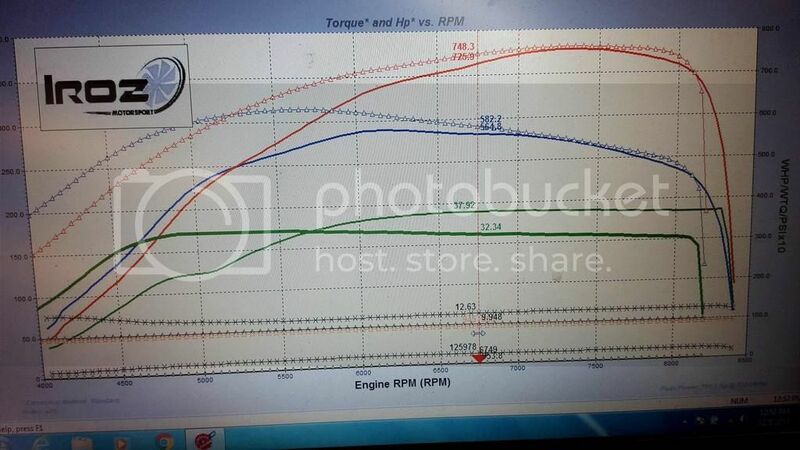 I wonder how much of the torque difference is displacement.....clearly not all of it. Thanks for sharing! Hank wrote: On e85, direct injection does nothing. On gas, overall hp it does little, though it does help modrange torque. Oems with dual rail setups are using GDi at torque peak and then blending in port injection up top. Why is it that e85 does nothing? are you comparing it to race gas or pump? He is saying that port injection and direct injection perform the same on E85, no advantage either way. Is anyone using the stock ECU and harness with these? Are they ME7? I have the means to tune it, I just would like some feedback for brainstorming purposes. Also I see IROZ relocates the oil filter and uses the same hunk of aluminum to mount the engine. Is there anyway practical way around this? After looking around a bit I see its very unlikely, but the question remains. lorge1989 wrote: Also I see IROZ relocates the oil filter and uses the same hunk of aluminum to mount the engine. Is there anyway practical way around this? After looking around a bit I see its very unlikely, but the question remains. That IS the practical way. Since it's designed as a transverse engine there are no lugs on the left side of the engine so they are integrated into this multi purposed 'hunk of aluminum' that flows oil and water as well as provides adequate mounting strength for high horsepower application. So in looking for engines for my project I'm seeing a ton of them from automatic equipped cars (no surprise, really). Are there any differences in the rear of the crank between the manual and auto early 07K engines? Any other differences between manual/auto engines to watch out for? Also (and I realize most of you are using these longitudinal)... has anyone put one of these together with a VW 02Q 6 speed? My project will be using it transverse and the GTI/GLI gearboxes have better gear ratios than the garden variety Golf/Jetta/Rabbit/Beetle do. Last edited by Rennkafer on Mon Mar 13, 2017 9:09 am, edited 1 time in total. The six speed swap is fairly common with the VW guys, I think its a direct bolt up. gabriel.b wrote: The six speed swap is fairly common with the VW guys, I think its a direct bolt up. There are two different 6 speeds though, the 02A/J and the 02Q... 02A/J came in the higher option regular Jetta/Golf/etc and the 02M was the GTI/GLI box so the 07K never came with the 02M attached from OEM. Any idea which is commonly swapped and what flywheel/clutch combo they're using. Multiple searches have turned up pretty nigh nothing specific. I want to use the 02M since research indicates it's stronger, it has better gear ratios, and more parts available. Last edited by Rennkafer on Mon Mar 13, 2017 9:10 am, edited 1 time in total. ^ lol this is what happens when I don't look at my notes. 02A/J are the stock 5 speeds. I did a bunch more looking around and found a couple people that had done this. Appears it's not a big deal from a flywheel/pp outlook which was my main concern, they just used the flywheel/pp from the GTI on the 07K. Since a 1.8t flywheel will work on the 07k, are we able to use a '240mm' flywheel designed for converting 1.8t cars to 240mm? Same 6 bolt flywheel bolt pattern, then we have the ability to use 240mm clutch kits with the 01E? Sent you a PM. I have this clutch for sale. Will this clutch work on a 7a engine? I have a brand new KF771-SS-DXD-B southbend for sale (for 7a). A1QSHIP wrote: Will this clutch work on a 7a engine? I suspect it will, if you have any old pressure plates that you can measure, I can compare the two.